If you or a member of your family is suffering from instability or balance issues, it is only normal to make their safety your number one priority. There are a number of ways that you can make their life a little easier in your Sterling Heights, MI home. One of this is by installing a grab bar in your bathroom. Grab bars are popular among homes who have family members that suffer from balance disorder or families with elderly members. This tool can help a lot in ensuring that they can support their body as they move around the bathroom area. Your Sterling Heights, MI home’s bathroom is considered to be one of the most private parts of your home. Private because this is where you do things which you do not want other people to witness like showering and using the toilet. If your family member has balance issues or you have an elderly in your home, it can be quite uncomfortable for them to be assisted inside the bathroom. They may feel that their privacy is violated somehow, making their bathroom experience very uncomfortable. This should not always be the case. If you hire our company, we can help you remedy this situation. Prevent Accidents – One of the leading causes of accidents among the elderlies is slipping in bathroom. However, this is not just a problem for the elderlies. It can be a problem to you or any of your family members too. Installing grab bars in Sterling Heights, MI can help ensure that accidents will be avoided during shower time or when using the toilet. 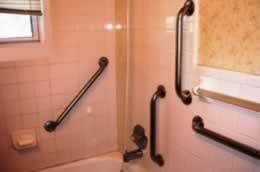 Confidence – Installation of grab bars in Sterling Heights, MI can boost the confidence of people with mobility or balance issues. This can give them some sort of independence during their short private time in the bathroom. Increase Bathroom Safety – You may not suffer from balance issues, but still, installing Sterling Heights, MI grab bars can double your bathroom’s safety. You will never know when an accident will occur, so you better prevent it than be sorry in the end.